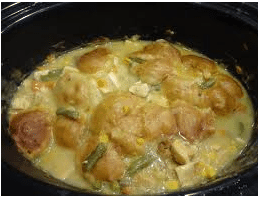 As the weather gets cooler, I love to make this easy Crockpot Chicken and Biscuits recipe! Get out your crockpots in the morning for this one-pot comfort meal of chicken, veggies and biscuits; serve in the afternoon or early evening. Set crock pot to low and add soup, pepper, Garlic Powder and chicken. Cook about 2 -3 hours or till chicken is cook through. Add veggies about 1 hour before serving. Cook biscuits about 18 minutes before serving like it instructs on the packaging. I love this recipe!! It is so good and healthy!! Especially on cold winter evenings! Let us know of any Slow Cooker recipes that you love and want to share!!! For more great recipes, head over to our Recipes section! How do you make your Crockpot Chicken and Biscuits Recipe? If you double the mac and cheese recipe above how does that affect the time that it would need to cook for? How many people do you think it would feed if I double the recipe (side dish)?